This post comes from Ilaria Camerini and Erin Fitterer, Rakow Library interns during the summer of 2018 working on the conservation of Library collections, including the Whitefriars stained glass cartoon collection. Read more about this project and the collection in previous posts. This summer, we’ve had the opportunity to work on objects beyond the Whitefriars collection. These objects represent a range of materials and techniques and have presented new and fascinating challenges for us. Tiffany Studios, 1902, CMGL 89006. Like the Whitefriars cartoons, these projects are also part of the planning process for creating pieces of glass. Artists often create drawings and watercolor sketches to plan out what they want to do in advance. 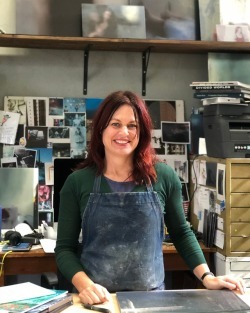 Workshops hire artists and designers to create potential designs. 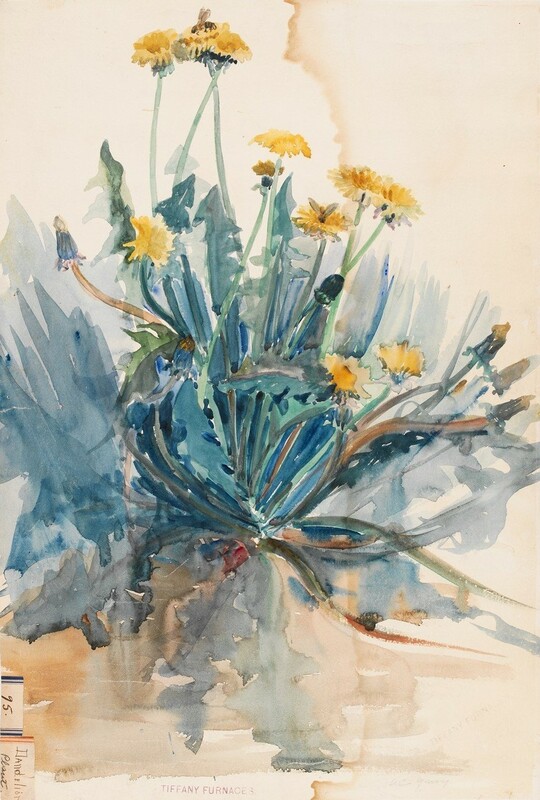 These dandelions, for example, were painted by Alice C. Gouvy while she was employed by Tiffany Studios. Many of Gouvy’s sketches were later used to inspire windows, lamps, jewelry boxes, and other items produced by Tiffany Studios. Often these types of drawings and sketches were made without any particular object in mind. Similar to Gouvy’s dandelions, this watercolor sketch by Frederick Carder features a pastoral scene with bathers. This image could have been translated onto a number of objects, including a stained-glass window, an enameled box, or etched onto the surface of a vase. We had the chance to work on Carder’s sketch this summer. There is a crack running from the left to right side. There are also additional cracks along the bottom edge. Fortunately, these cracks do not go all the way through the object. We were able to insert glue along the crack and carefully burnish the edges together. [Fountain with bathers], Frederick Carder, Frederick Carder papers, CMGL 706160. Detail of Carder’s design. Note the crack running across the image. On occasion, blueprints would be drawn up and distributed as part of the design process. Though they may appear to be drawings, blueprints are actually made through a photographic process known as cyanotype. An engineer would draw a design — perhaps plans for a building, schematics for a machine, or a design for a household item — on thin paper. This drawing was placed over specially prepared paper and then exposed to sunlight. Afterward, the exposed paper was treated with a combination of potassium ferricyanide and ferric ammonium citrate. This chemical reaction produced the blueprints. Because they were produced through a photographic process, blueprints allowed engineers and designers to create accurate plans without having to painstakingly redraw the design over and over. This led to fewer errors and greater accuracy in manufacturing. 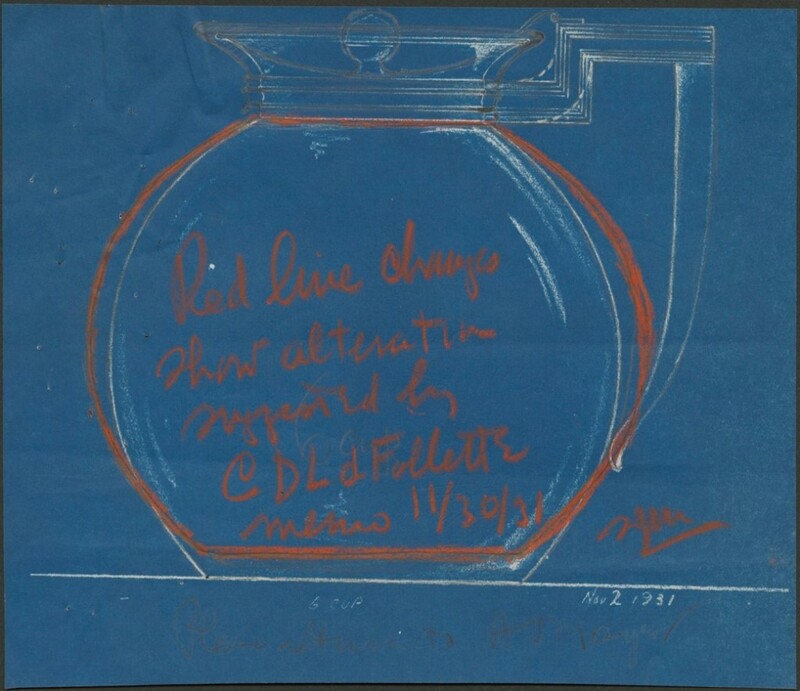 Frederick Carder papers, CMGL 142620. 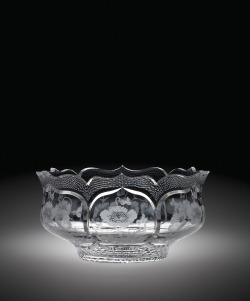 Blueprints were used in the manufacturing process at Corning Glass Works (now Corning Inc.). 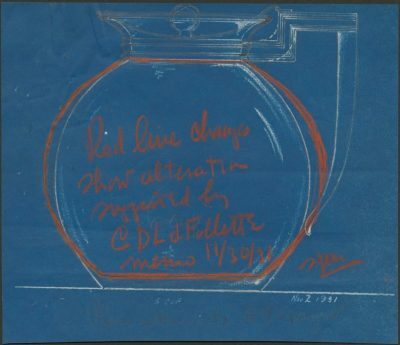 This drawing by Frederick Carder features a design for a Pyrex teapot printed via the cyanotype process. The red lines over the surface of the cyanotype are changes made after the printing process was complete. Blueprints were also made for a pair of glass candlesticks designed for Steuben by John Monteith Gates. While we consider the blueprints important documents today, at the time of their creation they were not highly valued. Instead they were viewed as strictly functional. Once the object was created, the blueprints were often discarded. Due to the nature of their manufacture, blueprints need to be stored in darkness when not being used. If exposed to excess light, they will fade. Eventually the blueprints will no longer be readable. Candlestick blueprint before treatment. See the treated blueprint below. These candlestick blueprints were in need of treatment. The paper was heavily creased and there were also numerous tears and areas of loss. After a great deal of time and care, we were able to flatten and repair the tears. Additionally, we elected to inpaint the cracks and exposed layers of paper. Inpainting is usually the final step in a conservation treatment. The purpose of inpainting is to visually integrate areas of repair and loss so that the viewer is focused on the object itself, rather than the repairs done to it. For these blueprints, the exposed paper layers were distracting to the viewer. Using Kremer watercolors, we carefully painted these areas so that viewers can focus on the blueprint itself, rather than the areas of damage. Giant candlestick by John Monteith Gates for Steuben Glass, 1940, CMGL 706000. Gift of CMoG Admin. Ultimately, these projects gave us the chance to expand our conservation skills while allowing us to learn more about the design and planning processes of glassmaking!